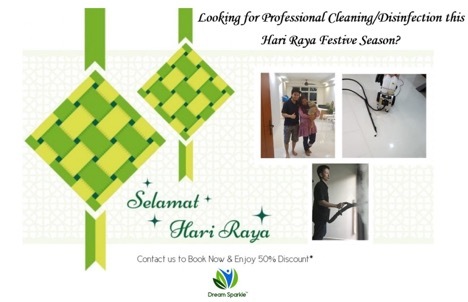 Hari Raya Promotion 2018 - Dream Sparkle Pte. Ltd. Exclude festive season, eve & public holidays. Operating Hours: Mon – Fri, 9am – 6pm, Saturday 9am – 6pm. This promotion/service is valid only upon agreement and confirmation of utilization via email/phone to DREAM SPARKLE, 3 – 5 working days in advance. Cancellations or postponement must be made 3 working days before appointment via email/phone to DREAM SPARKLE otherwise deposit will be forfeited. This promotion is valid for a single DREAM SPARKLE home cleaning service, cannot be redeemed for multiple visits on different occasions and to be utilize within the day itself. Customers have to inform us beforehand on what items requires special care. DREAM SPARKLE & partners will not accept any responsibility for claims, demands, losses, costs, expenses or liability of any kind whatsoever arising from or in connection with any transaction or dealing between the sales personnel and the customer in relation with the use of this promotion. Any additional cost exceeding the value of this promotion will be paid by the customers. DREAM SPARKLE reserves the right to amend these terms and conditions without prior notice. In case of any dispute, DREAM SPARKLE reserves the right of final decision. This promotion is valid for goods and services owned by DREAM SPARKLE and subject to availability and terms & conditions. This promotion entitles the customer to utilize the promotion/service specified herein, and is not exchangeable for any other promotion(s)/offer(s). The promotion price is only valid for HDB & Condominiums not exceeding the space area of 120 sqm, therefore if your space area exceeds 120 sqm please kindly email/phone DREAM SPARKLE for price enquiries. Final confirmation of cleaning slots availability upon receiving confirmation call/s, message/s or email/s from our customer service officer. All Flooring & Wall Tiles exclude Grout & Scale Cleaning. Topping up of Air-con gas and changing/repair/replacing of parts not included. Entitled to maximum of 3 Air-con units only for steam cleaning and disinfection. Air-con diagnosis consist of checking the Air-con gas level only. Exterior Cupboards only for bedrooms wardrobes and Kitchen cabinets only.